We have two EPIRB's on Cherokee Rose. The main one is an Alden Marine Sat Find 406 MHz. 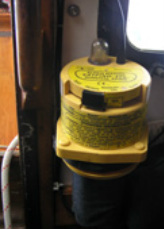 This is a category II EPIRB, meaning it is activated by immersion in water or manually. This is located in an easy to grab location by the companion way exit. The battery is good until 2006 and the strobe activates successfully on pushing the test button. Modifying ownership to new owner is as easy as going to a web page and filling in an online form. The second unit is a much older Class "B" unit by ACR Electronics an ACR/RLB-12. The battery is out of date however the led light still comes on during a test. I would not rely on this unit on its own, but as I keep repeating, I do like backups. This is located in the quarter berth with the grab bag and other emergency items.